An Armada of Royal Navy ships is poised to rescue Britons stranded by the aviation shutdown. The dramatic operation would carry thousands of families home from Channel ports in a rerun of the 1940 Dunkirk evacuation. Security Minister Lord West said commercial ships and amphibious landing craft could also be drafted into service. Every time in recorded history that Eyjafjallajökull volcano has erupted, the much larger Katla volcano has also erupted. Scientists are watching Katla carefully. Moreover, Iceland's "Angry Sister" hasn't even awoken yet. The three times in recorded history when Eyjafjallajökull has erupted, its neighbor, the much larger Katla, has followed suit. The 1918 eruption was the last major eruption of Katla – a volcano that has erupted twice a century, on average – which is why scientists have paid particularly close attention to it in recent days. But while earth beneath Eyjafjallajökull trembled with thousands of small earthquakes in the months before the eruption – signaling that magma was welling up beneath the volcano – scientists have not seen the same activity at Katla yet. As Iceland's glaciers thin, their weight upon the island's volcanoes will lighten, making it easier for magma to rise from the earth's depths, they say. LONDON - As airline losses from the volcanic ash cloud spiraled over $1 billion on Monday, the industry demanded EU compensation and criticized European governments for not using scientific measures to evaluate the ash and open up their airspace. Separately, senior Western diplomat said several NATO F-16 fighters suffered engine damage after flying through the volcanic ash cloud covering large parts of Europe. The official declined to provide more details on the military flights, except to say that glasslike deposits were found inside the planes' engines after they patroled over European air space. Over the weekend, several major airlines successfully tested the skies with flights that did not carry passengers. The announcement of successful test flights prompted some airline officials to wonder whether authorities had overreacted to concerns that the microscopic particles of volcanic ash could cause jet engines to fail. Shares of some European airlines fell as flight disruptions from the volcanic cloud moved into a fifth day, and the International Air Transport Association complained of "no leadership" from government leaders — one of whom admitted to EU dissension about how to respond. "It's embarrassing, and a European mess," IATA CEO Giovanni Bisignani told The Associated Press. "It took five days to organize a conference call with the ministers of transport and we are losing $200 million per day (and) 750,000 passengers are stranded all over. Does it make sense?" European civil aviation authorities held a conference call Monday about what steps could be taken toward opening airspace, and transport ministers from all 27 EU member states were to hold another later in the day. Dominique Bussereau, France's transport minister, told reporters Monday that he had urged EU president Spain ever since Saturday to call the ministerial meeting immediately — but Madrid declined. "Naturally, it would have been better if had taken place Sunday or Saturday," Bussereau said. British Airways said airlines have asked the EU for financial compensation for the closure of airspace, starting last Wednesday. With London among the first hubs shut down, the British carrier said it's losing as much as 20 million pounds ($30 million) per day. BA Chief executive Willie Walsh said European airlines have asked the EU and national governments for financial compensation for the closure of airspace. He pointed to a precedent: compensation paid to airlines after the closure of U.S. airspace following the Sept. 11, 2001 terrorist attacks. "This is an unprecedented situation that is having a huge impact on customers and airlines alike," Walsh said. "We continue to offer as much support as we can to our customers, however, these are extraordinary circumstances that are beyond all airlines' control." Environment Minister Jean-Louis Borloo — the No. 2 in the French Cabinet — said a meeting was planned Tuesday of French airlines, travel agencies and the government to examine possible state aid to the industry. "This aid will evolve of course based on the severity of the crisis. For that, we need a European pre-accord that we have obtained — an accord in principle so this sector aid can be allocated," Borloo told France's i-Tele. The IATA, in a statement, called on governments to place "greater urgency and focus on how and when we can safely reopen Europe's skies" — such as through more in-depth study of the ash cloud. "We have to not just use — as the Europeans were doing — a theoretical model, let's try to use figures and facts," Bisignani said." It means sending test planes at certain kinds of altitudes to check what was the situation with the ashes." While the association says "safety is our top priority," Bisignani said in the statement that its member airlines have run test flights with no problems and "they report missed opportunities to fly safely." Bisignani said that Europe — unlike the United States, for example — is "not well-equipped" when it comes to planes that can test the air quality in the skies. He estimated that once flights in Europe do resume, it would take three to six days for traffic to return to normal. France's Borloo said disparate analyses needed to be brought together based on "real tests on real planes with real pilots," so some air "corridors" could be reopened. "The issue today is not to reopen all European commercial airspace, the issue today is to increase the ability to reopen corridors to allow the general de-congestion of European traffic," he told reporters. "The desire of France — without taking risk — is to open corridors as much as possible and as quickly as possible." Pierre-Henri Gourgeon, the No. 2 executive at Air France-KLM, said his company is losing €35 million a day and called for more test flights to see if routes are safe to fly. He said the French-Dutch carrier conducted five test flights on its own Sunday and planned another seven Monday. Speaking to reporters Monday at Air France headquarters near Paris' main airport, Gourgeon said aviation authorities had relied on "insufficient" information when they imposed a near-blanket flight ban in some countries. Meanwhile, air traffic control agency Eurocontrol said airlines in Europe were expected to fly between 8,000 and 9,000 of their 28,000 scheduled flights on Monday. Air space in southern Europe, including Portugal, Spain, parts of Italy and France, the Balkans, Bulgaria, Greece and Turkey, and parts of northern Europe, was opened on Monday, Eurocontrol said. But authorities in Britain, France, Germany, and the Netherlands — home to three of Europe's largest airports — said their air space was still closed. Britain said it was keeping flight restrictions on through until at least early Tuesday, while Italy briefly lifted restrictions in the north then quickly closed again on Monday after conditions worsened. Meanwhile, U.K. Prime Minister Gordon Brown announced on Monday that he was sending Royal Navy warships to rescue Britons stranded overseas by the volcanic ash cloud. Austrian authorities reopened the country's airspace, though many flights there remain canceled, and Stockholm's Arlanda Airport was reopening for limited air traffic. Finland opened its Tampere and Turku airports but kept its main airport in Helsinki shut, and most Norwegian airspace reopened Sunday evening. The cancellation of flights into Europe because of fears over volcanic ash could be costing the Canadian air travel industry about $4 million a day, one expert estimates. Green said some of the plume of ash spewing from the volcano is heading to Newfoundland and Labrador. But it remains to be seen whether the ash has the potential to affect flights in Atlantic Canada. Green says the weather conditions that are pulling the ash over the Atlantic are rare and not expected to change for at least a week. The winds blowing between the high and lows are acting like a vacuum cleaner, taking the ash cloud and dragging it against the jet stream. "This weather pattern is going to persist for up to a week, at a minimum," he said. "So we can expect the ash to come across the Atlantic for up to a week." He says it's a near certainty that the plume will bring ash across the eastern seaboard, including through the New England states and eastern Quebec. But it remains to be seen what kind of concentrations of volcanic debris will be inside the cloud. "If the concentrations are sufficient to disrupt flight operations, it has the potential to disrupt flights in the eastern seaboard of the U.S.," Green said. Updated map of ash cloud. The western tip is touching Canada. 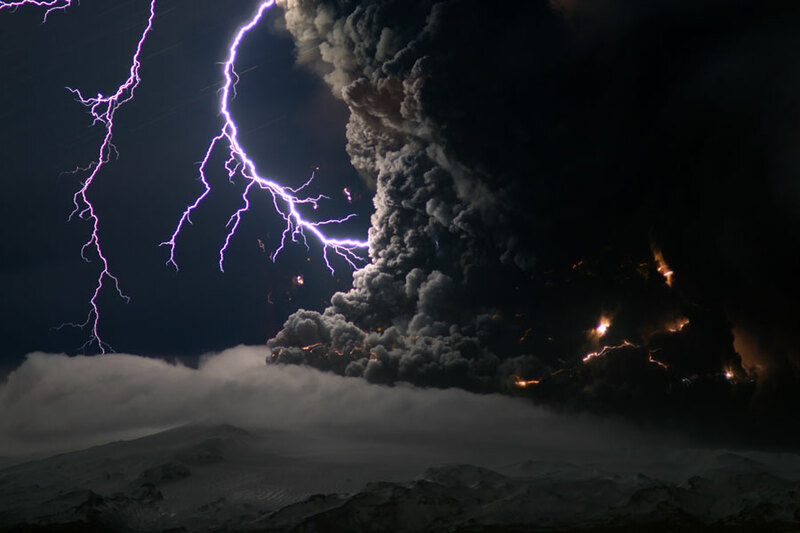 I remember reading somewhere, on here I think, about lightning being generated in a volcano. Here's a great pic of that. What an awesome pic, Rutsie! London, England (CNN) -- Half of all Europe's flights were back in the air Tuesday, but more ash from Iceland's erupting volcano threatened to stall plans to reopen British airspace. Although authorities in Iceland reported that eruptions from the Eyjafjallajokull volcano were weakening, volcanic ash already in the air continued to blow towards Britain. The country's weather forecaster, the Met Office, said current wind patterns suggested no let up until the end of the week. "At the moment current weather conditions aren't set to change until about Friday and then it looks like then the change is going to be south-westerly winds which will then take it away from the UK," a spokeswoman told CNN. About 14,000 flights were expected to operate in European airspace Tuesday -- half of scheduled air traffic, according to Eurocontrol, the intergovernmental body that manages European air travel. Flights were restricted to those above 20,000 feet, Eurocontrol said. Lower air space is closed or severely restricted across Europe, it added. Planes were back in the air in France, Germany and Italy. Around 75 percent of scheduled flights were expected from France's two main airports, Charles de Gaulle and Orly, French Minister for Ecology Jean-Louis Borloo told French radio network RTL. Germany's air authority, DFS allowed flights to take off and land in German airports at low altitude under visual flight rules to reduce the risk of damage to airline instruments. The country's main carrier Lufthansa said it hoped to operate as many as 330 flights, including some long-haul flights, Tuesday. Italy has reopened its airspace nationwide, the Italian aviation authority ENAC announced. While airports were open in Spain, the ban on flying in British airspace left thousands of Britons trapped in Spain. A British Navy vessel, HMS Albion was dispatched to pick up 300 civilians from Santander, Spain along with hundreds of British military personnel who were returning from Afghanistan, Britain's Ministry of Defence said. Some countries opened their airspace to travel, while keeping airports closed. Flights higher than around 20,000 feet were allowed through Danish airspace, the country's air traffic control service NAVIAIR said. Norway opened its part of its airspace near Bergen briefly on Tuesday and predicted Gardermoen, just north of Oslo, would be open all day, the country's air traffic control service AVINOR said. Meanwhile Finland confirmed all Finnish airports would remain closed until 9 a.m. local time (2 a.m. ET) Wednesday. British Airways issued a statement Tuesday apologizing to its customers for the continued disruption to its flight schedule. The airline said it was forced to cancel plans to operate some short-haul and long-haul flights Tuesday, but said it hoped to run a number of inbound longhaul flights, subject to air restrictions. It said it was working with other airlines to provide data to authorities which could lead to a reopening of British skies. A British Airways test Sunday found no damage to the aircraft at a variety of altitudes, the airline said Monday. Check out the ash cloud (2 posts above); it now reaches into Canada, and part is almost into Maine. I'm not going to re-post the link because it updates automatically so each time you go there you get the latest images available. I wish I could post the image, but I can't figure that one out; it isn't a JPEG. The eruptions and ash disturbance from the Eyjafjallajokull volcano might be waking up its neighbor, Katla. If this is the case, the results could be globally devastating. Activity at Katla has risen 200% in the last two days. The earthquake build up since the beginning of the year and subsequent eruptions at Eyjafjallajokull seem to be triggering the larger neighboring volcano, Katla. For the last two days, Katla has shown a dramatic 200% rise in activity. Geophysicists at Iceland’s Institute of Earth Sciences call Katla a vicious volcano that will be locally and globally damaging. Katla’s last eruption started in 1821, along side an eruption at Eyjafjallajokull. Katla has a pattern of erupting in sequence with Eyjafjallajokull. However, Katla is different. It is much larger and it will make the present eruptions in Iceland look mild in comparison. Scientists say that although Eyjafjallajokull eruptions are less frequent, Katla eruptions are significantly worse and larger. Historically, Katla has been shown to wake up whenever Eyjafjallajokull does, and sometimes on its own. This is why it is believed that Katla will erupt and it will be soon. Due to the up tick in activity, the locals believe that Katla will erupt in approximately 7 days. REYKJAVIK, Iceland (AP) - For all the worldwide chaos that Iceland's volcano has already created, it may just be the opening act. Scientists fear tremors at the Eyjafjallajokull (ay-yah-FYAH-lah-yer-kuhl) volcano could trigger an even more dangerous eruption at the nearby Katla volcano—creating a worst-case scenario for the airline industry and travelers around the globe. Katla, however, is buried under ice 550 yards (500 meters) thick—the massive Myrdalsjokull glacier, one of Iceland's largest. That means it has more than twice the amount of ice that the current eruption has burned through—threatening a new and possibly longer aviation standstill across Europe. Did British Airways FORCE the UK to open its airways? This is very strange!!!! London, England (CNN) -- British airspace is set to reopen Tuesday night, more than five days after it was closed because of ash from a volcano in Iceland, Britain's Civil Aviation Authority announced Tuesday. The move will reopen Heathrow Airport in London, one of the busiest airports in the world, which has not had a commercial flight land since Thursday afternoon. The announcement came with more than two dozen British Airways flights already in the air, bound for London. They took off hoping there would be a window of opportunity to land the planes at Heathrow or Gatwick airports, a company representative told CNN. The 25 planes took off from the West Coast of the United States, Africa, India and other locations in Asia. A 26th plane that had hoped to reach London was sent to Brussels, Belgium, instead, British Airways said. Asked if Heathrow was prepared to receive the inbound flights, airport operator BAA told CNN it would follow instructions from air traffic controllers. Half of all Europe's flights were back in the air Tuesday. the rest is just a rehash of the article from this morning. London, England (CNN) -- Airports across Europe began reopening Wednesday, six days after ash from an Icelandic volcano forced the shutdown of airspace and stranded thousands of passengers around the world. The airspace over most of the United Kingdom, Norway, Belgium, Ireland and Germany was open again, and Danish, Swedish and Finnish airspace was expected to reopen fully later in the day, air traffic authorities said. French authorities said all long-haul flights were leaving from Paris airports, along with 60 percent of short-haul flights. A British Airways flight from Vancouver was the first to land at Heathrow Airport late Tuesday, and a total of 25 mostly long-haul flights had landed by the morning, the airport said. There were a handful of takeoffs Wednesday morning, but the airport warned that not all flights would operate right away. Manchester Airport said flights were both taking off and landing Wednesday. That raised hope for a team of British cheerleaders who were trying to fly Wednesday from Manchester to Florida for the World Cheerleading Championship this week, though team member Georgina Evett said she wasn't holding her breath just yet. "I think when we land down in America, then we'll know we're there. But at the minute, we're a bit cautious," Evett told CNN. Passengers arriving on the Vancouver flight to Heathrow late Tuesday said they circled over Ireland for a couple of hours before getting approval to land in London, which prompted a big cheer in the cabin. "It was pretty harrowing," said one woman who was aboard the flight. She told CNN she had a "dizzy, kind of sickly feeling" in her stomach as they circled. The crisis began after the volcano beneath the Eyjafjallajokull glacier erupted Wednesday and sent a cloud of ash into the atmosphere. By the next day that cloud had reached Europe, where authorities quickly shut the airspace over safety fears. Volcanic ash can have dangerous consequences for flights by shutting down engines and electrical systems and damaging a plane's windscreen. By Tuesday, however, airlines had started to complain that the measures were too restrictive. Ash levels in most parts of Europe, they said, were low enough to allow the safe operation of flights. On Wednesday, British aviation regulator CAA issued revised its guidance on flying through volcano ash clouds. Previous guidelines recommended a total ban on flights through ash, but the new rules allow airlines to conduct their own risk assessments and require them to report any ash damage to the authorities. The International Air Transport Association (IATA) estimated Wednesday that the Icelandic volcano crisis cost airlines more than $1.7 billion in lost revenue through Tuesday. Between Saturday and Monday, when disruptions were greatest, IATA said lost revenues reached $400 million each day. "At the worst, the crisis impacted 29 percent of global aviation and affected 1.2 million passengers a day," said IATA Director-General and Chief Executive Giovanni Bisignani. "The scale of the crisis eclipsed 9/11 when U.S. airspace was closed for three days." Scientists in Iceland said Wednesday the volcano has decreased its ash output by 80 percent compared to the first day of eruption, April 14. Armann Hoskulsson, a volcanologist at the University of Iceland, told a briefing that the volcano's output is now "insignificant," though it will continue to be active for a while. That reduction in volcanic activity appeared to be the main reason that flights resumed operating in Europe on Wednesday, along with European countries relaxing their restrictions on flight, according to a spokeswoman for Eurocontrol, the intergovernmental body that manages European air travel. "Airspace was being closed based on theoretical models, not on facts," said Bisignani, of IATA. "Test flights by our members showed that the models were wrong." He said the EU's decision to categorize airspace based on risk was a "step in the right direction," but that Europe still needs uniform rules on air travel to avoid the chaos of the past week. The Daily Telegraph newspaper in London ran a a banner headline asking, "Why was ban ever imposed?" British Airways Chief Executive Willie Walsh, who had pushed for airlines to be allowed to fly, told Sky News that lessons could be learned about how the situation was handled, and that authorities should sit down and examine "what could have been done better." However, NATS, the air traffic authority in Britain, said it was confident it had made the right decision in restricting flights. wow. awesome picts. thanks, L.
hard to imagine that is static electricity same as the static we get in our carpets. ... wowser! As Europe's skies begin to open up, stricken businesses are starting to tally the cost of the volcanic ash plume. The airspace closures have snarled global supply chains, with knock-on effects all the way down the line, including in Asia. Every day, on average, 10,000 tons of goods are airfreighted between Asia and Europe. But none of that has moved for the past week, and huge stockpiles are clogging up freight forwarding centers and warehouses. For some exporters, such as Simon Aliband in Shanghai, the volcanic ash plume has paralyzed business-as-usual. "It's had quite a significant impact," says Aliband, the regional director of Otto International. Otto International is the world's biggest long-distance retailer, selling clothing online and to catalog companies. At the moment, Aliband says, the company has 292,000 garments stuck in airfreight warehouses in China, waiting to be flown to Europe. Otto International is a "just in time" business; it produces and ships goods to order, rather than having large stocks. So the freeze on flights has had a particularly dramatic effect: If end customers don't receive the goods they've ordered in time, they may well cancel. "We can imagine that our customers in Europe are losing millions per week," Aliband says. In Asia, the worst-affected companies include cell phone and semiconductor makers. Japanese carmaker Nissan has suspended production at two plants, for lack of parts imported from Ireland. In South Korea, one trade association put the cost of lost exports at more than $100 million. Michael Song of the European Chinese Enterprise Investment Promotion Association says members of his group fear unplanned production delays could result not only in monetary losses but also in damage to their reputations. Asian gourmets may also suffer: Hong Kong is running low on its stocks of Belgian chocolates, French cheese and Norwegian salmon. But it's not just about fast fashion and food. The crisis could end up pushing up prices for consumers, according to Greg Knowler, editor of Cargonews Asia in Hong Kong. "It will cost shippers -- the factories -- a lot more to send their stuff by air to Europe," Knowler says, adding that those costs traditionally get passed on to consumers. And some are warning that, even if the volcano does stop spewing ash, the backlog of cargo could take up to a month to clear. European airports sent thousands of planes into the sky Thursday after a week of unprecedented disruptions, but shifting winds sent a new plume of volcanic ash over Scandinavia, forcing some airports in Norway and Sweden to close again. The new airspace restrictions applied to northern Scotland and parts of southern Norway, Sweden and Finland, said Kyla Evans, spokeswoman for Eurocontrol, the European air traffic agency. But nearly all of the continent's 28,000 other scheduled flights, including more than 300 flights on lucrative trans-Atlantic routes, were going ahead. Every plane was packed, however, as airlines squeezed in some of the hundreds of thousands of travelers who had been stranded for days among passengers with regular Thursday tickets. Airlines said there was no quick solution to cut down the backlog of passengers, for most flights were nearly full anyway and no other planes were available. "Quite frankly we don't have an answer to this," said David Henderson, spokesman for the Association of European Airlines. Some travelers got a break. Authorities chartered a luxury cruise ship, the Celebrity Eclipse, to pick up 2,200 tourists in the northern Spanish port of Bilbao on Thursday and bring them back to England. A British Royal Navy ship also arrived in Portsmouth, southern England, carrying 440 troops coming home from Afghanistan and 280 civilians back from Santander, Spain. All of British airspace was open and major airports such as London's Heathrow - Europe's busiest - were operating nearly full schedules but airlines still warned passengers to check first. British Airways said all of its flights London's Gatwick and City airports would take off, as well as the "vast majority" of flights from Heathrow. Many trans-Atlantic planes flying between the United States and Europe were assigned flight paths above the ash cloud that still covered the area east of Iceland. Flying at over 35,000 feet, the planes were well above the current maximum altitude of the ash, which lingered in some places at 20,000 feet. The Swedish aviation authority said airspace is still open over the capital Stockholm, but closed over the southern cities of Goteborg and Malmo. Spokesman Bjorn Stenberg said changing winds meant the ash cloud over Sweden hadn't dispersed as forecast. Meanwhile, new ash clouds were blowing in over western Norway, where Stavanger and Bergen airports were closed. The weeklong airspace closures caused by the ash threat to planes represented the worst breakdown in civil aviation in Europe since World War II. More than 100,000 flights were canceled and airlines are on track to lose over $2 billion. The aviation crisis that began with the April 14 volcanic eruption in Iceland left millions of passengers in limbo, and the uncoordinated airspace closures by national governments sparked calls for a wholesale reform of Europe's air traffic management system. Scientists at the Icelandic meteorological office said the Eyjafjallajokull volcano produced very little ash Thursday but remained quite active, with magma boiling in the crater. The plume of ash was below 10,000 feet and winds were not expected to take it over 20,000 feet. Geophysicist Steinunn Jakobsdottir said volcanic ash was expected to fall south and southwest of the crater in southern Iceland in the coming days, but would not disrupt air travel between Europe and North America. The volcano threw magma chunks the size of cars into the air and sent powerful shock waves into the air as an Associated Press reporter, photographer and television crew flew over it Wednesday in a helicopter. In a black crater in the middle of a glacier, red magma thrashed about, propelling steaming blobs of lava onto the surrounding ice. Every so often charges of gas -- which surge from deep inside the mountain through the magma and cause tremors 15 miles away -- exploded in a fireworks show of molten rock. The air shivered with a constant, menacing growl, like a perpetual clap of thunder. Bolts of lightning shot through the fumes and an eerie glow pervaded the pit of fire. In response to the flight disruptions, the European Union said it was stepping up work on a new management system known as the "Single European Sky" that will largely erase national borders in the sky. The ash crisis "exposed serious flaws and that is something that probably cannot be ignored much longer," EU spokeswoman Helen Kearns said. In contrast, the U.S. air traffic management system is twice as efficient. On any given day, it manages twice the number of EU flights for a similar cost but from only about 20 control centers. European governments and civil aviation authorities defended their decisions to ground fleets and close the skies -- and later to reopen them -- against heated accusations by airline chiefs that the decisions were based on flawed data or unsubstantiated fears. IATA also demanded that the EU's strict passenger rights rules, which force airlines to pay for hotels and meals in cases of routine flight delays, be relaxed to reflect the extraordinary nature of the crisis. Military aviation also was partly paralyzed, although NATO took the precaution of moving its Boeing E-3A early warning radar planes to southern Italy. From there they were able to conduct high-altitude surveillance missions. "Military flying within the UK was brought to a complete halt other than search-and-rescue sorties," said Glenn Sands from Air Forces Monthly, adding that a graduating ceremony for pilots had to be moved back several weeks. (CNN) -- Recriminations are emerging in the wake of the volcanic ash crisis with airlines expressing anger over passenger compensation rules and demanding financial help for losses caused by what they say was a needless ban on flights. Michael O'Leary, chief executive of budget carrier Ryanair, has led criticism of European Union regulations that require operators to feed and accommodate stranded passengers, saying his airline has only agreed to pay under duress. "The events of the last seven days, under which Europe's airlines were prevented from flying by the closure of European airspace highlight how absurd and discriminatory the EU261 regulations are towards Europe's airlines," O'Leary said in a statement. Ryanair, which sells some flights for less than $10 but charges for extras including baggage, earlier said it would reimburse claims up to the cost of tickets, but later backed down saying it would meet "reasonable" expenses. "While competitor ferry, coach and train operators are obliged to reimburse passengers reasonable expenses, this reimbursement is limited to the ticket price paid to those operators," O'Leary added. "Yet the airlines are required by regulation to meet potentially unlimited expenses, in circumstances where there has been a catastrophic closure of European airspace over the past seven days, as EU Governments and Regulators wrongly applied a blanket ban on flights over European airspace." His comments follow complaints by airlines and industry bodies that the six-day flight ban imposed by authorities due to ash from and Icelandic volcano, were unduly cautious. The International Air Transport Authority, which says the ban cost the industry $1.7 billion in lost revenue, called on the European Union to ease the financial burden on airlines. Giovanni Bisignani, IATA's Director General and CEO, said the volcano crisis was an "act of God" beyond the control of airlines, who are now being victimized by unfair compensation regulations. "The regulations were never meant for such extra-ordinary situations. It is urgent that the European Commission finds a way to ease this unfair burden," Bisignani said in a statement. British Transport Minister Andrew Adonis said European authorities were considering requests for financial assistance by airlines and defended the flight ban. "It was not a mistake. The safety authorities have quite properly been making safety their paramount consideration," Adonis told CNN. "Unless we can guarantee the safety of the air traveling public, there will be no planes flying at all." He added: "The European Commission and the European Union is looking at the financial issue in respect of airlines. They are making proposals next week and I will of course be looking at those proposals." "Passengers have right if they are with EU carriers to be re-routed, which gives them a ticket home and and food and accommodation in the period that they were unable to travel. These rights are enshrined in EU regulations and passengers should exercise them," he said. (CNN) -- Iceland will close two airports on Friday for the first time, a week after ash from an Icelandic volcano forced the shutdown of airspace over much of Europe and stranded thousands of passengers around the world, the Icelandic aviation authority announced Thursday. The Keflavik International Airport and Reykjavík International Airport will be closed beginning early Friday morning, the aviation authority said, according to a statement on the Keflavik airport's website. Though the ash cloud originated in Iceland, the country's airports have been spared from closure until now. Strong northwest winds had been blowing ash from the volcano, in the south of Iceland, out to sea and over Europe. "Now the winds have died down, and the cloud is lingering around Iceland," said Chris Almond, a forecaster with Britain's Met Office, the nation's national weather service. Two other Icelandic international airports, in Akureyri and Egilsstadir, will stay open to all air traffic, the aviation authority said. The ash cloud is not expected to reach those cities, which are in the north and east of the island nation. Icelandair announced Thursday that trans-Atlantic passengers from the U.S. and Europe who would have stopped in Keflavik will be rerouted Friday via Glasgow, Scotland. Icelandair said that passengers traveling to and from Iceland will have the option of being re-routed through the Akureyri airport, a four-hour drive from Reykjavík. The airline is arranging bus travel between Akureyri airport and the Reykjavík Bus Terminal. Elsewhere in Europe, most airports appeared to be open on Thursday and are expected to be open Friday. But the cloud still caused flight disruptions Thursday. The British Ministry of Defence temporarily suspended non-essential flying Thursday after volcanic ash was found on some of its Typhoon fast jets. The International Air Transport Association estimated earlier this week that the Icelandic volcano crisis cost airlines more than $1.7 billion in lost revenue through Tuesday. The crisis began after the volcano beneath the Eyjafjallajokull glacier erupted April 14 and sent a cloud of ash into the atmosphere. By the next day that cloud had reached Europe, where authorities quickly closed the airspace over safety fears. Scientists in Iceland said Wednesday the volcano has decreased its ash output by 80 percent compared to the first day of eruption. "Airspace was being closed based on theoretical models, not on facts," said Giovanni Bisignani, director general and CEO of International Air Transport Association. "Test flights by our members showed that the models were wrong." LONDON — Virgin Atlantic founder Richard Branson says the Europe-wide ban on flights prompted by the volcanic ash cloud was unnecessary. Branson said Saturday that his engineers insisted planes could have flown without any danger from the ash, spewed by Iceland's Eyjafjallajokull (pronounced ay-yah-FYAH-lah-yer-kuhl) volcano. Flights across Europe were grounded for several days, causing chaos for travelers and businesses. 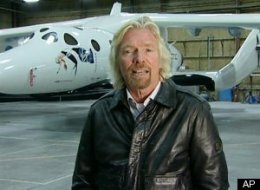 Branson said his airline lost 50 million pounds ($77 million). He says Britain's government has now "accepted that there was overreaction," and called for airlines to be compensated for their losses. British airspace was closed for six days. Authorities say Europe is now almost completely free of volcanic ash. Specialists from the Institute of the Earth Sciences (http://www.earthice.hi.is/ ) and the Icelandic Meteorological Office (http://www.vedur.is) flew over the eruption site in Eyjafjallajökull late yesterday. The lava flow seems to be of similar volume as in recent days (20-40 tons per second). The quantity of the volcanic plume is slowly decreasing. The flow of lava is most likely to have started near noon on April 21 when water started flowing continuously from Gígjökull. Steam plumes rose from the northern edges of the caldera after noon on that day and could be seen from a helicopter. Deflation associated with the volcanic tremor was noticed at the same time. There are no signs of melting or flow of water to the south. There are also no indications that the eruption is coming to an end. There are still disruptions in domestic and international flights, according to information from ISAVIA, and passengers are therefore strongly advised to seek further information from air carriers and at: http://www.textavarp.is/ . Height( a.s.l): Unknown, not seen above cloud cover at 5.3 km. Conditions at eruption site: Overall activity similar as yesterday. Eruption seen from west in the morning – north crater still active. External water has not affected vent activity much since 18 April. Geologists field observations (2-10 km from vents) show that explosivity is magmatic and that the tephra produced since 18 April is much coarser than during first four days. Explosions heard at Fljótshlíð, 10-15 km NW of vents. Meltwater discharge suggest similar lava activity. Processing of data obtained yesterday shows that lava had advanced 400-500 m northwards from crater, forming an ice depression extending some 700 m from vents. Meltwater: 100-120 m3/s, based on gauge at old Markarfljót bridge and a rough estimate of base flow. GPS deformation: Indicates slow subsidence towards the center of the volcano. Magma flow: Eruption plume: less or equal to 10 tonnes/s. Wanna see the impact of the Air Space Interuption? Thanks, L, those are fantastic. Look at all the lightning! I read a description of how it is formed by the volcano, but I forget. DUBLIN - Airports in Ireland and parts of Britain were closed again for hours on Tuesday because of the cloud of volcanic ash drifting south from Iceland that wreaked havoc on European air travel last month. The Irish Aviation Authority (IAA) allowed flights to resume from Irish airports from 1200 GMT after a closure lasting six hours. Dublin airport said flight schedules had reverted to normal operations. Britain's National Air Traffic Services (NATS), which had imposed a no-fly zone in the west of Scotland and Northern Ireland, also opened all UK airspace from 1200 GMT, apart from a small no-fly zone in the northwest with no impact on UK flights. Flights in much of continental Europe were operating as normal. However, the IAA said northerly winds forecast for the coming days could bring more clouds of ash from the Icelandic eruption and disruption for passengers this week. "We could be faced with this periodically during the summer," IAA Chief Executive Eamonn Brennan said. "We are probably facing a summer of uncertainty due to this ash cloud." The IAA had closed airports from 0600 GMT due to risk of ash ingestion in aircraft engines, although overflights of Ireland from Britain and continental Europe had not been banned. European flights overall were expected to be at almost normal levels on Tuesday, European air traffic agency Eurocontrol said. On a typical weekday, just under 200 flights would be expected in and out of Ireland, compared with around 28,000 throughout Europe, a spokeswoman said. However, fresh ash from the erupting volcano could cloud airspace over northern Britain for the next few days following a change in direction of the wind, Iceland's meteorological office said. Much of European air traffic was grounded last month because of the spread of ash from an erupting volcano under the Eyjafjallajokull glacier in Iceland. Some 100,000 flights were canceled and millions of passengers stranded. The airspace closures cost Europe's airlines 1.5 billion to 2.5 billion euros ($2 billion-$3.3 billion), the European Commission has estimated. Former Irish state airline Aer Lingus said that last month's shutdown of several days cut its earnings by about 20 million euros ($27 million). The final bill will hinge on the impact on passengers' longer-term travel plans. Shares in Aer Lingus, which also separately reported encouraging first-quarter trading on Tuesday, dropped 4.11 percent by 1232 GMT, while Ryanair, which is much less dependent on the Irish market, dropped 1.61 percent. Airlines Air France-KLM, British Airways, Iberia and Lufthansa were between 1.58 and 4.12 percent weaker, in a lower overall market. "While the current airspace restrictions are likely to be brief, we can't rule out persistent sporadic air travel disruptions in parts of Europe going forward depending on ash cloud movement," Deutsche Bank commodities analyst Michael Lewis said.